The Center for Accelerating Operational Efficiency (CAOE), led by Arizona State University, develops and applies advanced analytical tools and technologies to enhance planning, information sharing and real-time decision-making in homeland security operations. The research at CAOE will help the Department of Homeland Security improve efficiency and security at our national borders, ports and airports through better prediction and response to emergencies. Split-second decision-making. Wise allocation of scarce resources. Accurately predicting cascading consequences of natural and manmade disasters. These are just some of the complex challenges our country’s homeland security workforce faces each day. The research, systems and technology developed at CAOE provide homeland security agencies with real-time information, predictive tools for resource and response planning, and systems that increase the odds of resolving security problems. The CAOE, a DHS Center of Excellence, is looking for UNLV students interested in Homeland Security and Data Analytics for an opportunity to gain hands-on experience working on a research project to improve airport checkpoint operations. 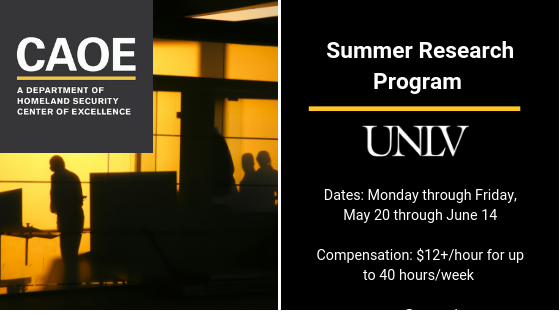 This paid educational and research experience will include both classroom lectures on data-driven systems analysis methods and field work at McCarran airport. Target Audience: Motivated UNLV undergraduate or graduate students in business administration, engineering, computer science, economics, mathematical sciences, or related areas with basic knowledge of mathematical modeling, statistics, and any programming language. Requirements: US Citizens. Students need to attend all training and experiential sessions and complete a group project to qualify for payment. Data collection and experiential activities: McCarran International Airport. To Apply: Send a CV to brendan.morris@unlv.edu or email for more information. In 2004, the National Center for Risk and Economic Analysis of Terrorism Events (CREATE) at the University of Southern California was selected as the first University-based Center of Excellence (COE) funded by the Office of University Programs (OUP) of the Department of Homeland Security. Recently, CREATE conducted a two-year benefit-cost analysis (BCA) of selected OUP supported homeland security research products. This presentation will first provide an overview of CREATE during its 15 years as a COE.